Colby Suggs – RHP – Arkansas – Jr. 1.1IP 0H 0ER 1BB 2K. Mike Mayers – RHP – Mississippi – Jr. 7IP 6H 2ER 0BB 6K. (W, 1-0). Tyler Beede – RHP – Vanderbilt – So. 6.2IP 5H 1ER 3BB 8K. (W, 3-0). Jerad Grundy – LHP – Kentucky – Sr. 8IP 2H 0ER 0BB 12K. (W, 3-0). Colby Holmes – RHP – South Carolina – Sr. 4.2IP 8H 5ER 1BB 3K. (L, 1-1). Daniel Mengden – RHP – Texas A&M – So. 8IP 4H 3ER 4BB 8K. (W, 3-0). Ryan Eades – RHP – LSU – Jr. 6IP 5H 0ER 0BB 11K. (W, 2-0). Daniel Starwalt – RHP – Stanford – Fr. 3.1IP 3H 0ER 1BB 3K. (W, 2-0). Against Texas. Nick Vander Tuig – RHP – UCLA – Jr. 7.1IP 6H 2ER 1BB 1K. (W, 2-1). Ryan Burr – RHP – ASU – Fr. 2IP 0H 0ER 0BB 2K. (S, 2). Dan Child – RHP – Oregon State – Jr. 7IP 3H 0ER 2BB 5K. (W, 3-0). Carlos Rodon – LHP – NC State – So. 7IP 2H 1ER 3BB 16K. Nathan Kirby – LHP – Virginia – Fr. 2.2IP 5H 2EWR 3BB 1K. 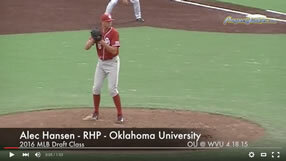 Jonathan Gray – RHP – Oklahoma – Jr. 6IP 5H 3ER 2BB 7K. (L, 2-1). Trey Masek – RHP – Texas Tech – Jr. 9IP 6H 0ER 0BB 12K. (W, 2-0). Riley Ferrell – RHP – TCU – Fr. 1IP 0H 0ER 1BB 2K. Dillon Peters – LHP – Texas – So. 5IP 8H 2ER 1BB 4K. (L, 1-1). Cameron Cox – RHP – Texas – So. 1IP 0H 0ER 0BB 0K. Chad Hollingsworth – RHP – Texas – Fr. 0IP 2H 0ER 0BB 0K. Trae Davis – RHP – Baylor – Jr. .1IP 0H 1ER 2BB 0K. Jeff Thompson – RHP – Louisville – Jr. 6.2IP 3H 2ER 2BB 8K. (W, 3-0). Conor Krauss – RHP – Seton Hall – So. 1IP 1H 2ER 2BB 2K. Jordan Stephens – RHP – Rice – So. 5.2IP 7H 5ER 2BB 6K. (L, 1-2). Kevin McCanna – RHP – Rice – Fr. .1IP 2H 1ER 0BB 0K. Michael Lorenzen – RHP – Cal State Fullerton – Jr. 1IP 1H 0ER 0BB 0K. (S, 3). Justin Garza – RHP – Cal State Fullerton – Fr. 8IP 6H 2ER 1BB 4K. (W, 3-0). Matt Imhof – LHP – Cal Poly – So. 5.2IP 9H 3ER 0BB 4K. (W, 2-0). Braden Shipley – RHP – Nevada – Jr. 7IP 6H 1ER 2BB 7K. Derick Velazquez – RHP – Fresno State – So. 9IP 7H 0ER 2BB 5K. Tyler Olson – LHP – Gonzaga – Sr. 7.1IP 7H 2ER 4BB 5K. Alex Balog – RHP – San Francisco – Jr. 7IP 7H 4ER 3BB 3K. Dylan Covey – RHP – San Diego – Jr. 6IP 5H 0ER 2BB 12K.